Apple Slaw is so QUICK to make and everyone loves this crunchy, fruity salad ! No mayonnaise or yogurt AND you can make the salad in advance ! 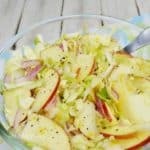 Coleslaw has, and always will be one of our favorite salads, but this Apple Slaw is just fantastic. 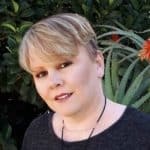 No mayonnaise (or yogurt!) in this dressing. 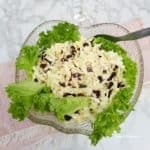 Simple, yet delicious, Cabbage and Onion Salad with raisins is the ideal addition to most main meals and especially good served with barbecued meat This is one of my favorite and almost always go to salad. The Cabbage and Onion salad can be served with just about any main meal and even kids love it.